And…another one bites the dust. This is the first month that I felt like I really hit my stride with my business processes. I spent a lot of time setting up automated sales system (goal from last month) and it really paid off. Hubby and I have had some serious conversations about me leaving my job in a few months, so my focus now is just beating my work salary every month (plus extra for taxes and marketing) from here on out! Let’s get it! 2. Finish building a passive income stream. I also finished building out my sales funnel, which is where the majority of my sales in March came from. 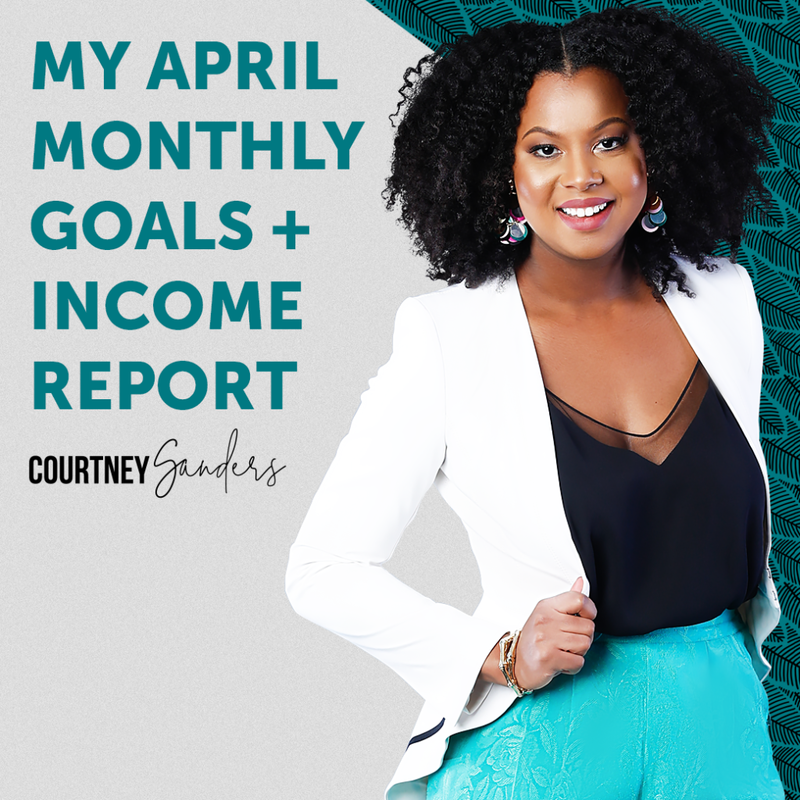 In my last report, I talk about the utter importance of having passive revenue systems in your business because I personally experienced a reduction in sales when I wasn’t available for a few weeks to work “in” my business. Sales funnels and other passive systems allow your products and services to be sold on autopilot, even if you get too busy to “launch” a new product, which was the case for me last month. 1. Fill my new mentorship program. I ended up unexpectedly coming up with a new Sales & Marketing program after casually offering some advice to one of my entrepreneurial friends over lunch. She was so elated by everything I taught her off the top of my head – literally, I wrote out an entire marketing funnel for her on the back of napkin – that I realized I should create a formal program to teach other female entrepreneurs the same information. I thought my knowledge about systems, sales, and marketing was common knowledge but according to my friend, it’s not. So I’m really excited to roll out this new program to help female entrepreneurs quickly make sales in their business. If you’re interested, make sure you’re on my email list (just join my accountability group!) as I’ll be sharing more details about it soon. 3. Successfully launch my “life reset” challenge. Now that it’s spring and the first quarter is over, I plan on hosting a new challenge to help everyone “get back in the saddle” with their goals. Many of the women in my audience have said they’re ready for a “reset” so that’s exactly what this challenge will give them! My goal is to successfully launch it this month and have 2,000 women (eek!) join! 4. Get my new bookkeeper all setup. I ended up finding an amazing CPA to do my taxes and bookkeeping last week and I am SO excited about it! I’ve been handling my bookkeeping myself in Wave up until this point but…I hate bookkeeping and there’s definitely more productive things I could be doing with that time. I’m learning to hire professionals to operate in their gift so I have more time to operate in mine. Really looking forward to getting these coins organized! My goal is to give her everything she needs so she can get me squared away this month. Now that I’m aware of it, I literally catch myself slipping into “Oh yeah, I’ll do that when I get [insert overly complex and unnecessary excuse] first.” I have to tell myself, “No Courtney, you don’t need all that, you can do it now.” It’s still a struggle because I have perfectionist tendencies but I’m working on it! Having a profitable sales funnel. I’ve already waxed poetically enough about the power of an effective sales funnel but if you don’t have one, build one ASAP. It truly frees you up to invest more time and revenue into other areas of your business, which then generates more sales. Furthermore, having an automatically pipeline for new audience members to take you up on your products often leads to them wanting to work with you one-on-one, which I’m already experiencing this month. Growing my Instagram following. Instagram is such an amazing platform! It’s so funny – when I first got on, I was self-conscious about posting because I’m not good at photography. So for about a year, Instagram was just a place for me to look at everyone’s photos. At the beginning of the year, I made a concerted effort to grow my instagram following and it’s really paid off. More people organically find out about my brand from Instagram than with any other platform. So I will continue to post regularly!